I think my husband deserves to be treated every day of the year for being an amazing dad to our 7 children so when it comes to Father's Day we like to make a bit of a fuss of him. He's generally happy with a lie in then a cup of coffee in bed followed by a full English breakfast and some time to relax in front of whatever sport happens to be on TV with a break from the endless list of DIY I have in my head for him. He wouldn't say no to a beer or a glass of red wine either to make his day complete. This year however I was challenged to find him a special gift at the O2 Centre in Finchley Road, London where a variety of shops and eateries and a huge car park make it a convenient place to eat relax and shop. I started in Habitat. Not a store you'd initially think of for Father's Day gifts but I found quite a selection for men who are sick of golf, football and beer themed presents. 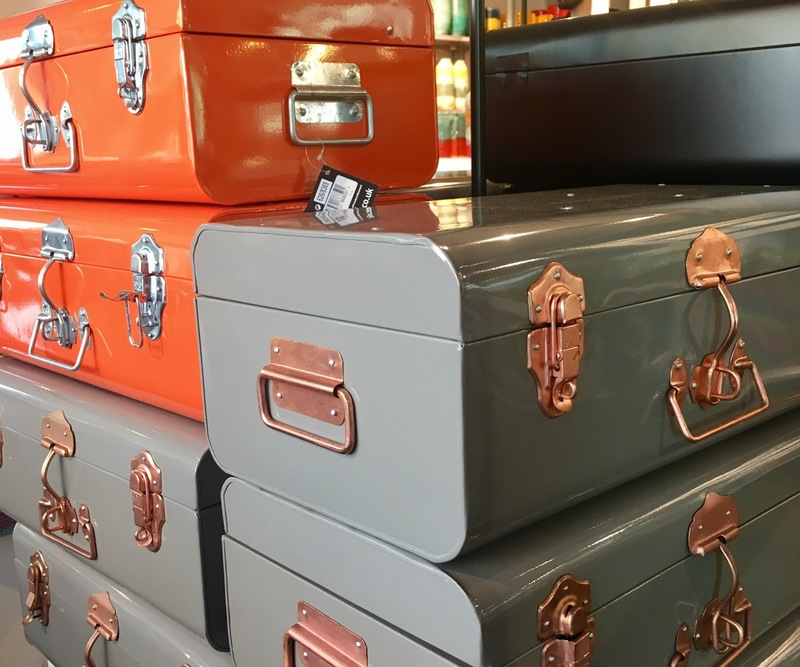 I loved these chests - perfect for stylish storage of any kind whether you want to gently prompt him to hide his collection of zombie movies or maybe he could use them to store home office bits and pieces so he doesn't have to look at them at the weekend. The chests come in orange, grey and black and in two sizes - I am slightly obsessed with grey at the moment so the grey one would definitely be my choice. 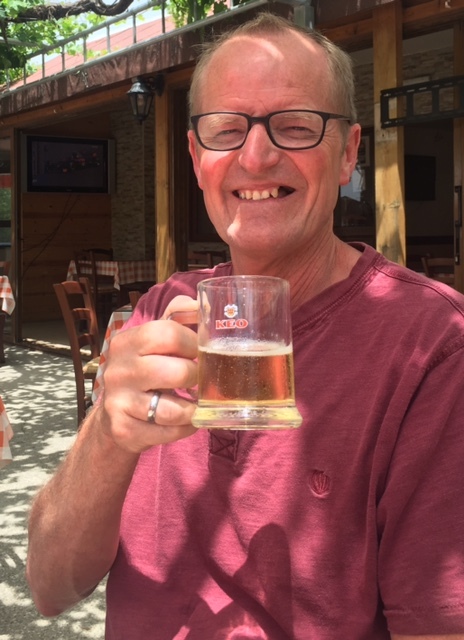 They'd be good for my Dad out in Cyprus too - he has been unwell and has lots of medical bits and pieces which could be stored in one of the smaller chests. The bigger chests could be used to store away his winter clothes (yes they need those in Cyprus) when the hot weather comes along. My husband seems to hoard odd glasses, remainders from mostly smashed sets and mostly ones which won't fit in the dishwasher so I was tempted to buy him these gorgeous glasses. Trouble was I couldn't decide between the black or white design. Maybe mix and match? They had nice decanters too. My shopping seemed to be leaning towards things I wanted to buy for me rather than the dads in my life and this continued when I popped into Paperchase. I have a penchant for vintage style telephones and Paperchase has a couple of gorgeous ones - check out this on-trend copper-coloured beauty! Reminding myself I was supposed to be shopping for the dads, I picked out some cute robot clocks which I thought would be fun on the bedside table - they come in a couple of designs and sizes. Incidentally my teens liked these too so might make good pressies for any birthdays coming up for hard to shop for older children. 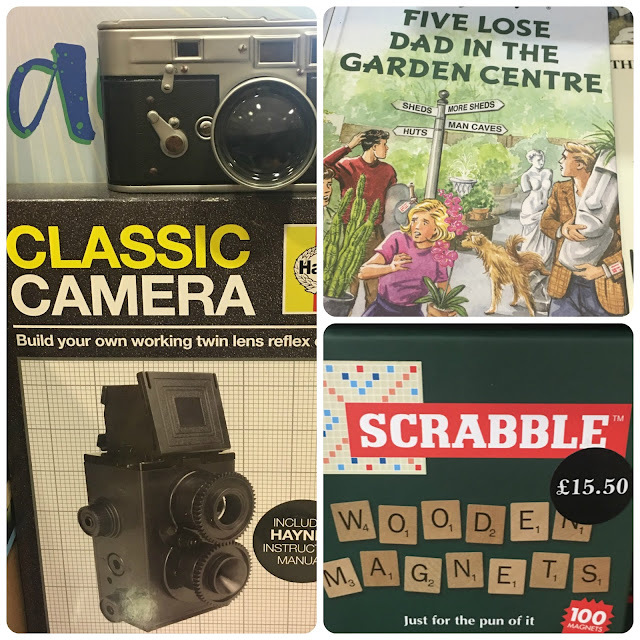 Moving onto Waterstones I found a wide range of gifts for Fathers Day and not all of them were books! I loved the wooden magnet scrabble for the fridge and the hilarious Five Lose Dad in the Garden Centre Enid Blyton style book. You could buy dad something to occupy him on Father's Day - how about the Haynes Build Your Own working twin lens classic reflex camera? There were lots of camera related gifts in Waterstones actually- I liked the camera shaped storage tin and the realistic camera lens travel mug. Once again, I found myself coveting stuff I would like and forced myself to refocus on the task in hand. I started heading to Homebase which is out of the main mall and across the car park but riding down the escalators I got distracted by the Father's Day display in the entrance to Sainsbury's. I spotted a very cool Super Mario Bros T-shirt but sadly (and unsurprisingly) they had almost sold out and the one T-shirt remaining was the wrong size. They have probably restocked by now so if you love this as much as I did, head to Sainsbury's quick! If branded clothing and products are what you are looking for you actually can;t go wrong in Sainsbury's. I found an awesome Batman travel mug which I ordered online from an auction site at Christmas which was cheaper in the supermarket at the O2 Centre. There was a whole host of themed socks - always welcome gifts in our house where my husband's plain black socks seem to magically disappear when the older boys can't find any of their own. My favourite novelty gift of the whole day was in Sainsbury's too - miniature crazy golf with 9 small textured mats and tiny clubs and balls. There are even water hazards built in! A bargain at just £8! Is the dad in your life a foodie? 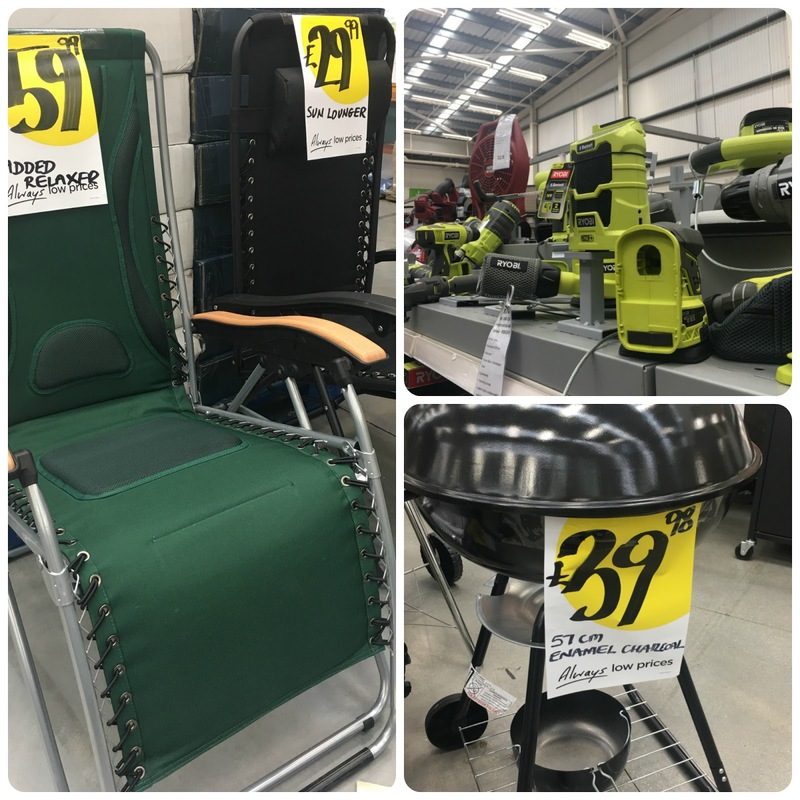 Once again Sainsbury's proved a winner with lovely sets like this BBQ hero kit. For the home and garden I found a cute light for dad's den and nice slate plaques for dad and grandad. Tech lovers can go mad there too and a serious contender for my purchase decision was a bluetooth soundbar for our TV to enhance his sport and movie watching experience. They have really come down in price ranging from £45 upwards. I liked the Blaupunkt offering which seemed a bargain at £55. Now my man's not a reader but I will mention that Sainsbury's had the all new 6" glare free wifi kindle with touchscreen display for just £60 (and nectar points too!). There was a huge range of power tools which would make hubbies mouth water and I honestly could have picked up just about anything from the display to make him happy. I'm never sure what he's actually already got in his extensive collection though so I carried on looking. I spotted the classic Black and Decker workbench which I knew would be a good purchase - his one has seen many years of hard use and is looking quite tired. There was a choice of sizes and designs in my budget of around £50-£60 which was much less than I expected them to be. But maybe it's not so much that he likes DIY than the fact that I make him do it. Maybe I should treat him to a comfy garden chair so he can relax after work instead of sawing and hammering. Maybe I could treat him to a new BBQ- no wait. He's never barbecued a thing in his life! It's me that likes to cook over charcoal. When I wandered down the barbecue aisle I found my favourite thing of the day although once again I think I was thinking of me rather than him. This, my friends, is the Louisiana charcoal powered pizza oven which I think is a bargain at just under £80. I like making pizzas and my husband likes eating them so surely this would be a good gift for both of us to enjoy? Ah well - that will have to remain a secret as my husband reads the blog and I don't want to spoil the surprise! Happy Father's Day to all those dads, stepdads, acting father figures and mums doing both mum and dad's roles in one. Here's hoping you have a lovely day on Sunday! Disclaimer: This is a sponsored post, Views and opinions remain honest and my own.